The KTM 1290 SUPER ADVENTURE T is ready to travel to the top of the food chain, matching its need for speed with your lust for life. This extremely well-equipped 1,301cc powerhouse goes from cruising with a passenger to racing a local at the flick of your wrist. And without breaking a sweat, thanks to KTM’s advanced electronics that help you outrun and outsmart tricky conditions. It has never been more comfortable to leave your comfort zone. So go, chase the horizon. You might even catch it. Stability and control are the foundations of riding fun. With its ultra-lightweight tubular trellis frame, a high strength, die-cast, open-lattice swingarm and top quality components from WP Suspension, the KTM 1290 SUPER ADVENTURE T will cement a grin on your face. Keeping asphalt lovers in mind, the KTM 1290 SUPER ADVENTURE T is fitted with a 19-inch wire-spoked wheel up front; 17-inch at the rear. Quality tires and proper suspension travel push its cornering skills to the next level and brakes from world-renowned market leader Brembo, coupled with assistance systems (MSC with MTC and lean-sensitive C-ABS) developed in close collaboration with Bosch, round off the package. Safe. Fun. Fast. Everywhere. The KTM 1290 SUPER ADVENTURE T gets a set of extremely grippy and durable Pirelli Scorpion Trail II’s sized at 120/70 ZR 19 and 170/60 ZR 17. They are the perfect wingmen for this corner stormer and as it happens also very eager to take you off the beaten path. The combination of lightweight chassis engineering and a compact but powerful engine take the KTM 1290 SUPER ADVENTURE T to the top of its class in terms of power-to-weight ratio and ride dynamics. This fully equipped adventure bike tips the scale at 249 kg, while carrying a substantial 30 liters of fuel. 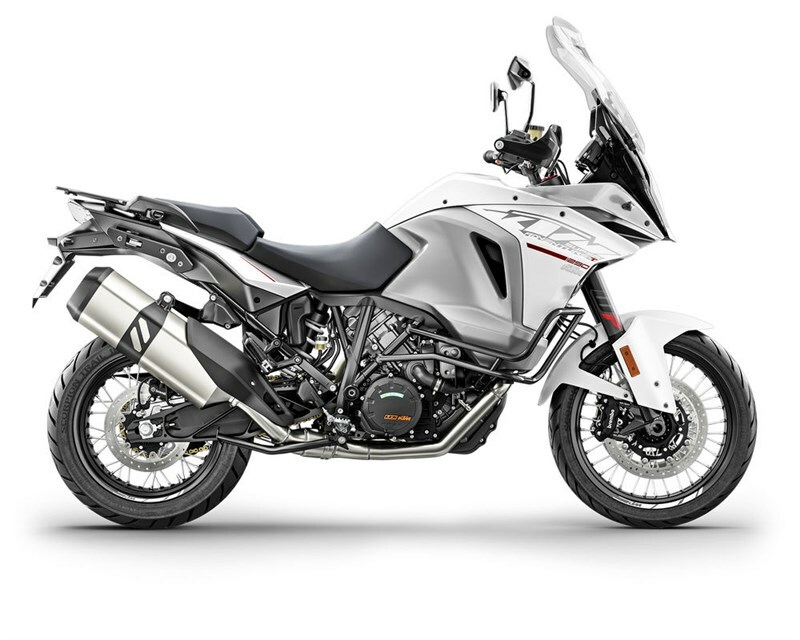 This makes the KTM 1290 SUPER ADVENTURE T – in typical KTM style – one of the lightest motorcycles in its segment. Add an outstanding geometry, well-balanced stiffness distribution and high quality suspension components and you end up with one vivacious bike. This also boosts safety, since it is far easier to fling a nimble motorcycle around a source of danger than a heavy one. We fit the KTM 1290 SUPER ADVENTURE T in-house with our patented, tubeless, wire-spoked 19"/17" wheels. They combine all the benefits of a tubeless tire (easy fitting and dynamic advantages due to the lack of an inner tube) with the stability and robustness of a wire-spoked wheel. This set-up makes the SUPER ADVENTURE T's rims substantially more resilient than all the competition's cast and spoked wheels. The chrome-molybdenum steel trellis frame makes a major contribution to the bike’s excellent chassis geometry. It’s a rugged, laser-cut, robot-welded thing of beauty with a glorious surface finish. And at only 9.8 kg, it helps to keep the total, unfueled weight at a spectacular 222 kg. The die-cast, open-lattice swingarm is not only particularly light, it's also precisely manufactured. The design has been optimized for stiffness and stability while still offering excellent flex characteristics. The innovative WP semi-active suspension system introduces a new level of focus and safety in motorcycle riding. The rider can select four spectrums of use: ‘Comfort’, ‘Street’, ‘Sport’ and ‘Offroad’ while the SCU (Suspension Control Unit) adapts the damping rates in real-time to the riding surface and rider, based on the information provided by a set of stroke sensors and accelerometers. It also reads the vehicle load, making the suspension suited to different weights. The result: road-hugging handling all the way. Precise. Powerful. Stunning. Just as you would expect from a set of Brembo brakes. Up front you’ll find twin 320 mm discs, radially mounted, 4-piston fixed calipers and a radial master cylinder. At the rear, excess speed is taken care of by a generously dimensioned 267 mm disc. And in case of an emergency, Bosch’s two-channel 9ME C-ABS speeds to the rescue. With so much propulsive power, the front wheel can become very light, which can lead to unpleasant kick-back on uneven roads. 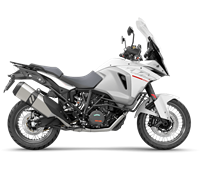 The KTM 1290 SUPER ADVENTURE T prevents this with a subtle WP steering damper that will be there when you need it.